The BB Drilling division has been drilling and coring boreholes worldwide since 1944. We currently have a fleet of eight drilling rigs of various sizes and provide conventional and wireline coring, air flush and mud flush drilling, down the hole hammer and reverse circulation drilling. Our fleet of rigs further enables us to drill from small and difficult locations or inside buildings. 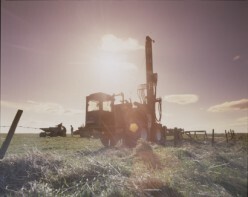 We have tracked, tractor and lorry mounted rigs available to drill to depths of 300m. We are highly experienced in coring, drilling shallow waterwells, boreholes for earth rod installation, GSHP boreholes and site investigation. We are also able to offer hollow stemmed augering, window and windowless sampling, SPT's and dynamic probing. Casing advancing systems at 90mm, 115mm and 140mm ID are also available. BB also operates a 125mm OD dual wall flush jointed reverse circulation sampling system for optimum sample returns. As soon as ground is released at the bottom of the hole the cuttings are flushed into the bore of the pipe and protected from contamination with the hole. At surface a hydrocyclone separates the samples from the air/water mix and deposits them into a sock. The system will work in both hard and soft formations such as sands and gravels.